I absolutely LOVE teaching Tall Tales! I am so excited about starting this genre! We always have sooooo much fun with it! We read, put on plays, create puppets, write our own puppet scripts, write our own tall tale stories with exaggerations, sing songs, and hold a tall tale tea.....it's fantastic! I'll be posting more about all of these as we go through the unit. I am definitely not an artist, but I do think they turned out pretty cute! Each craftivity comes with all of the tracer templates needed to create the character and an "Is - Can - Has" chart (both in present and past-tense). After we read a tall tale about a character students work in small groups of 3 students to complete a craftivity. I decided that it would take WAY tooooo long and use WAY tooooo much construction paper for each student to create each one on their own. So, I give each small group the tracers and materials they need and they have to work together to trace, cut-out, and assemble the character. Then they also work together to come up with facts they've learned about the characters to complete the charts. It has been a GREAT teamwork activity! They are so focused and serious about it! ;) And, the charts and their discussions (as I roam around) really let me know what they have learned about that character and story. I printed each set on a different color of cardstock. You know there are always pieces left behind at clean-up time and I wanted to be able to easily locate the set with the missing piece if this was the case. The great thing about the tracers is they have the character's initials on it and a label telling students what it is (for example, the tracer for John Henry's hat trim would say "JH hat trim" on it). I forgot to snap a pic of our John Henry products today, so I'll add that (along with Davy and Sally Ann Crockett) to tomorrow's Friday Flashback! My plan is to make ANOTHER pack so I'll have all of the characters on-hand, but that's going to have to wait a bit because I'm in the middle of finishing up my Memoir Writing Unit....hopefully this weekend! Would you like to be one of the first to own this Craftivity Pack? I'll be giving one away to a commenter using the random number generator in a FLASH GIVEAWAY!! Congratulations to Cathy for winning this unit!! These look super fun! I follow Teacher's Clubhouse on Facebook! 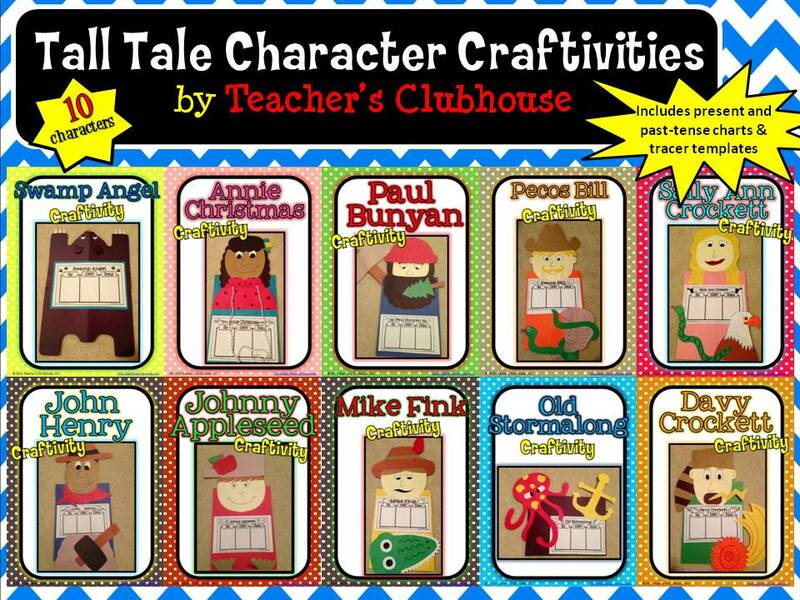 I follow Teacher's Clubhouse on TPT! I follow Lightbulb Minds on Facebook! I follow Lightbulb Minds on TPT! I love this idea! I follow Teacher's Clubhouse on TPT. I saw these on Facebook yesterday and thought they were so cool! I follow Teacher's Clubhouse on FB! I follow Lightbulb Minds on FB! I follow Teacher's Clubhouse on fb! I follow Lighthouse Minds on fb! I follow Lighthouse Minds on TpT! I follow Teacher's Clubhouse on Facebook. 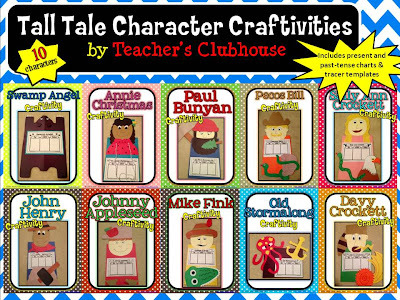 I follow Teacher's Clubhouse on TPT. I follow Lightbulb Minds on Facebook. I follow Lightbulb Minds on TPT. I follow Teachers' Clubhouse on TPT. I like Lightbulb Minds on FB. I liked Teacher's clubhouse on Facebook. Hi! I am a follower of Light Bulb Minds on TPT (kconsoli) Love the craftivity! Thanks for sharing! I am a follower of Teacher's Clubhouse on TPT (kconsoli). Thanks again for sharing! I am a follower of Light Bulb Minds on TPT. I am a follower of Teacher's Clubhouse on TPT. I'm a follower of Teacher's Clubhouse on FB. I'm a follower of Teacher's Clubhouse on TpT. I'm a follower of Lightbulb Minds on FB. I'm a follower of Lightbulb Minds on TpT. I follow Teacher's Clubhouse on Facebook! I follow Teacher's Clubhouse on TpT!! I follow Teacher's Clubhouse on FB. I follow Lightbulb Minds on FB. I follow Teachers Clubhouse on TpT.